Blah rainy day!! It felt like a hurricane out there today. I had Matt at home for a bit this morning, but he was sleeping in after some witching hour crying. Poor Matt’s shifts always coincide with fussy hour. We made up for that with lots of playing during dinner! 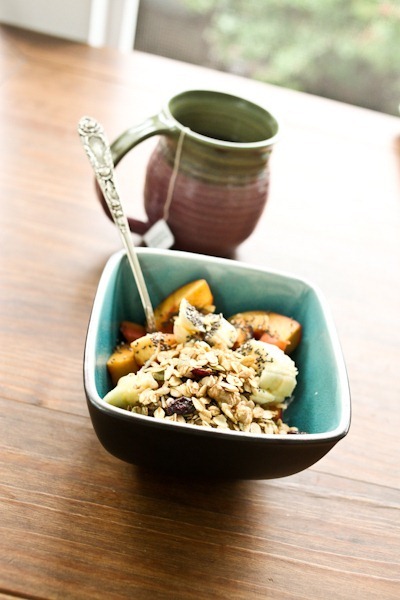 Plain yogurt, peach, banana, chia seeds and tons of Autumn Spice granola – now obsessed!! 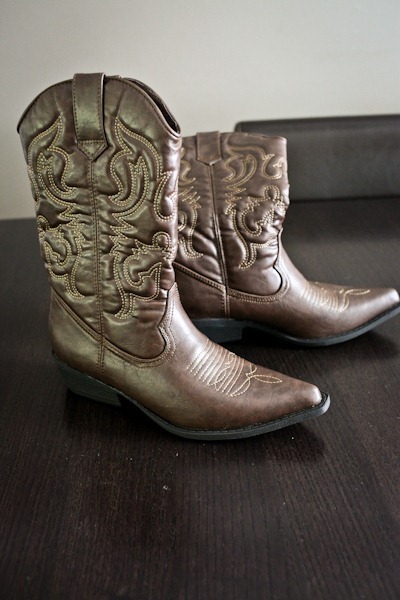 Karen and I made plans to go to the mall because I needed a pair of cowboy boots for the wedding I’m in in two weeks! But luckily since there were two of us, I was able to drop Karen and Mazen off with the stroller and then go park the car in the rain. Crying baby did not like it! VERY frustrated with how difficult it is to use the Bugaboo on the go. Not only does it require 2 (or 3 or 4) hands to open, but you have to remove the carseat adaptor to break it down. I got soaked in the 60 seconds it took me to do this in the rain. The storage basket is also not the greatest and I don’t like the handle bar. I fixed this problem on Wednesday with a new purchase! Shopping was fun and once we got him settled down, I found a pair of boots that were both reasonably priced and very comfy! Madden Girl for $70! Karen and I were both impressed with the Belk at Fashion Square Mall! Maze got hungry towards the end of our trip and I fed him in the shoe department on a comfy couch. Amelia gave me this AMAZING Alternative Apparel wrap that she loved for breastfeeding. (The same one in purple for my newborn photo shoot). Please note I pulled it farther over him for a modest photograph but he had plenty of breathing room while he was feeding from the side and above! 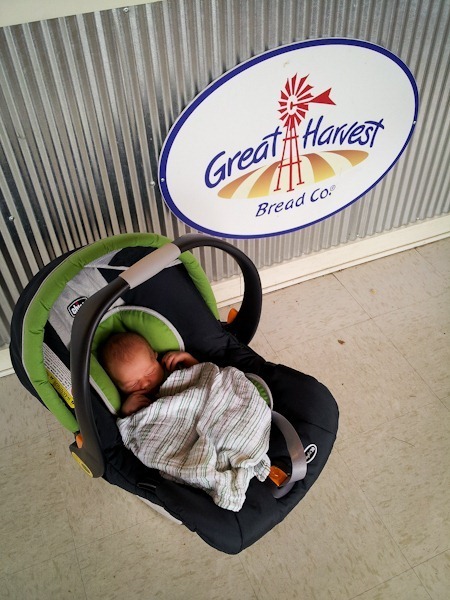 Our next stop was our first visit to Great Harvest!! He smiled when we walked in – he loves the smell of freshly baked bread! 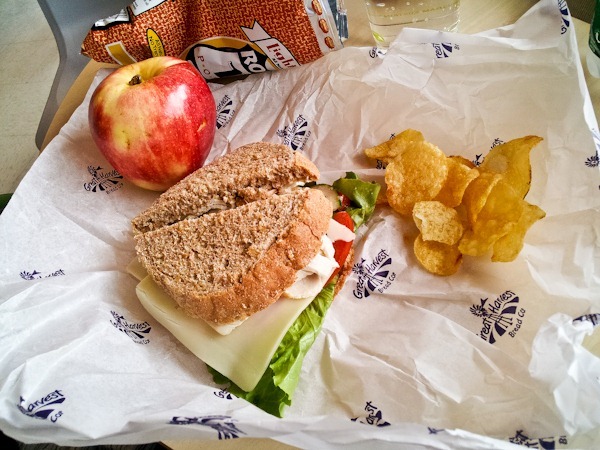 I had a Turkey + Swiss sandwich, chips and an apple for lunch! 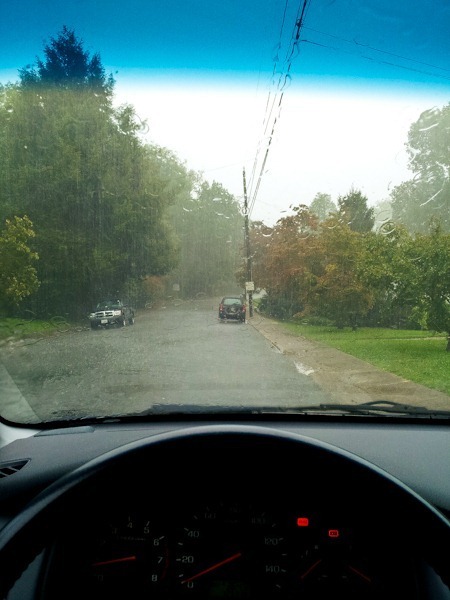 On the way home, I got stuck in a massive rainstorm. Wish I had a garage! I ended up climbing over to the passenger side, opening my umbrella and trying to keep it over the baby while I quickly walked inside. We both still got wet! So excited when Dad came home! 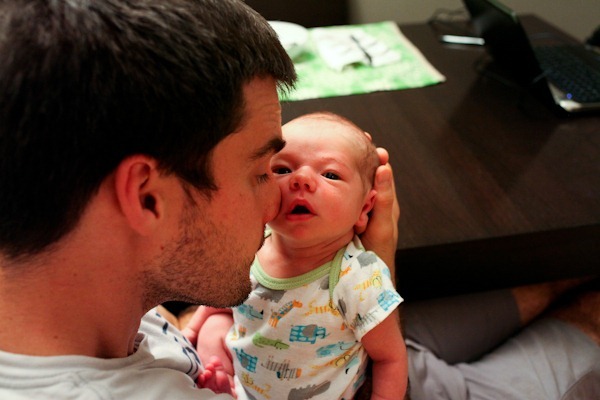 Please shave that scratchy beard, dad! Of all the foods that are forbidden during pregnancy, I missed red wine the most. A glass of wine with dinner tasted so incredible! 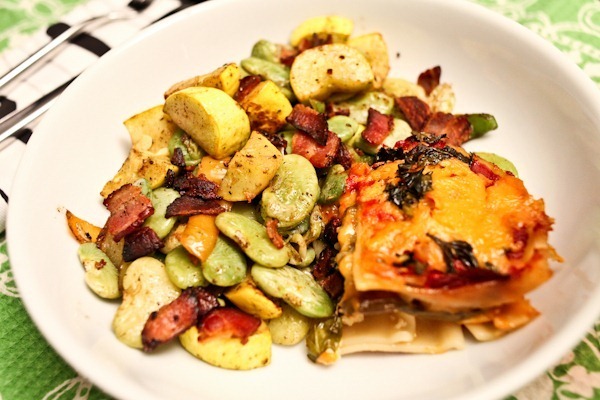 Underneath, we had leftover Faith lasagna and an awesome succotash on the side. Matt had a few cups of fresh butter beans he got at the market on Saturday that were the base of this recipe. He seared two slices of bacon in a pan and then boiled the beans for about 15 minutes in another pot. 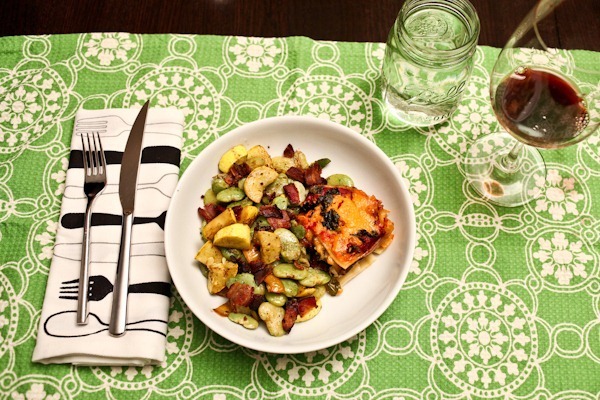 He removed the bacon from the first skillet and then added the beans along with a tbsp of butter, Southern seasoning and summer squash. I LOVE thick, fat beans and this was so good – I had seconds! Early to bed for me! 8-9pm is my new bedtime. I slept until 1am with a feeding in the middle and then took over baby watch from 1-8. There was only one meltdown last night and several happy feedings, and I woke up to the most beautiful fall day imaginable! I know you’re not supposed to eat cold lunch meats when pregnant, but is it really the end of the world if done on occasion and purchased at the grocery deli counter? 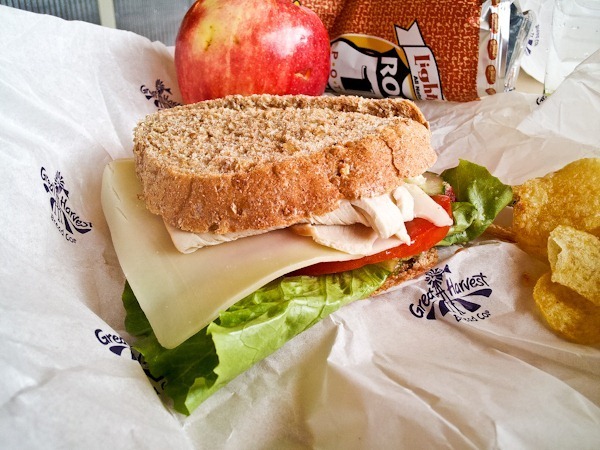 I’ve never ever gotten sick from lunch meat…thoughts? I know you ate it while pregnant and heated it up. Thanks, Kath! And Mazen sure is a cutie! I ate non heated up deli meat when I was pregnant. I just made sure it was fresh. My doctor told me only to stay away from raw fish (and of course alcohol). I had asked about deli meats since I had heard/read about the risk of listeria, but she told me not to worry. So I would suggest talking with your doctor about it to see what their take on it is. I haven’t had any issues and my whole pregnancy has been without issues…other than being a week late! I’ve eaten it during my pregnancy, just only a few times. I think it’s one of those things that you have to decide for yourself, and do it in moderation. I keep wondering how I will manage rainy days and grocery shopping with a newborn. We live on the second floor of a condo complex and my car is across the parking lot. Do I bring baby up first or hope that the huge canopy on our stroller keeps her dry? It was great that Karen was there to help you with the drop off at the mall. I hope you got some type of snap and go for the car seat like you talked about! That should make it easier. LOVE reading about your baby days!! Thanks for posting! For you dilemma with the grocery shopping, I would recommend getting a good baby wrap (like the Moby or the Boba) and putting your baby in it when you get home so you have both arms free to carry your groceries in. You may have to make more than one trip but at least baby will be with you and not in the apartment or car alone. It looks like you are handling all of the obstacles that come with a new baby perfectly Kath! It really is amazing to see the transformation your life is going through! Regarding your coffee dilemma, have you ever thought of purchasing a tassimo or Keurig? Every morning I put in a disc of coffee, press a button and my hubster has his 1 cup of coffee in about 45 seconds! No hassle! I use it for tea as I am not a coffee drinker…just a thought! Yes, I agree! A Keurig is worth it! I recommend any of the models higher than the Mini (it leaks water). I need my coffee in the am, but could never get the amount right for a pot brewer. Cant’t live without my Keurig now! i even love my mini! the only time it leaks water is when my roommates pour more than the allowed 10oz in the water tray. we had pools of water everywhere until i realized that’s what was happening. not a machine error- a user error! 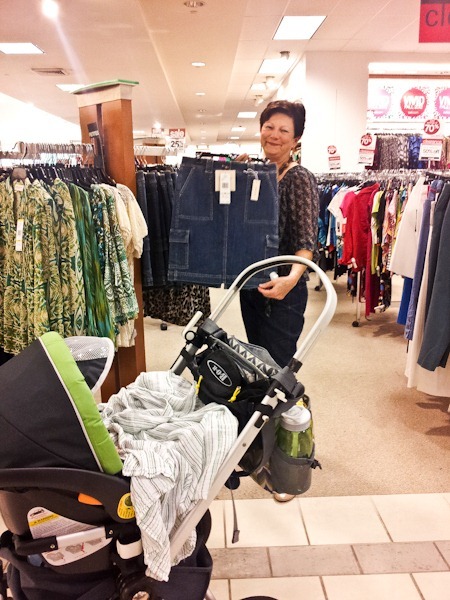 Girl, you need a snap-n-go stroller! The are so great with the infant car seat, so lightweight, great for using at airports/gate-checking without worrying about ruining a nice stroller, and they roll relatively well for short distances. I am SO glad I bought mine. Enjoy your beautiful fall day! Just a beautiful post, Kath! I love Belk! This is the first time a blogger has mentioned it. They have great clothes and shoes and home stuff for affordable prices! M really is such a cutie! Love his sweet face. And red wine. I love red wine, too. awww he really is just adorable!!! and yes – manouvering in rain + baby = not fun! You didn’t link directly to the wrap – do they not have it any more? Do you know if it is called the Stevie Wrap? I found something similar when I googled. It looks so convenient! Yeah, I couldn’t find it either. I will look up the Stevie Wrap though. I was hoping to find one for nursing too! Glad you got out for awhile. Those are cute boots! That meal looks amazing, but I don’t know how you eat beans while breastfeeding. Doesn’t that give Mazen terrible gas pains? (Sorry, if that’s TMI.) You may be used to them, but I would think he wouldn’t be able to tolerate the after effects. I’m not sure why it would cause gas? Breastmilk is not made directly from nutrients ingested, it has to go through a lot of secondary and tertiary processes until it get to the specialized endocrine glands of the breast and components like fiber stay in the GI tract. I’m really enjoying these posts. 🙂 So much to read, rather than short ones. The Photo of Matt holding him is just priceless! I’m so glad you feel comfortable feeding him out in public! Did you get a snap-n-go or equivalent? That’s the absolute easiest (and cheap!) newborn car seat stroller on the market. We just kept ours in the trunk of the car & used the fancier stroller for walking from home. Otherwise, if the car was involved, it was the snap-n-go all the way! I was going to ask you what food (or drink) you missed the most. Well I guess since you said the drink, is there a food you missed that just didn’t agree with you when you were preggers? Sorry you and the lil nugget got wet. I love that stroller bag! what a lovely day! i’ve heard similar things about the bugaboo – but also lots of people who swear by it. to each her own! 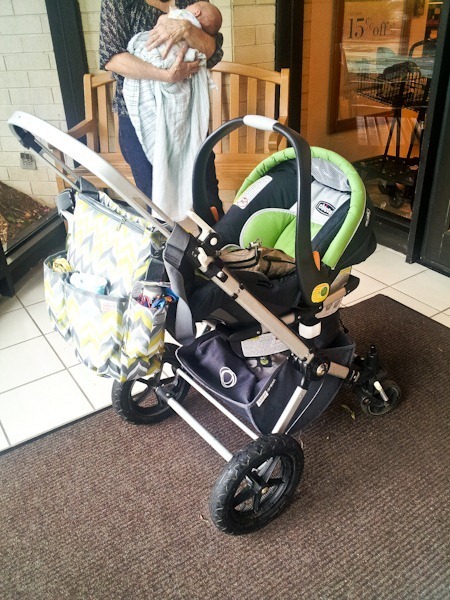 We used an Eddie Bauer travel system and it worked great! You could open it simply with one hand and just snap the car seat in and take it out very easily. I’ve never heard of a stroller where you have to take the seat attachment out to collapse it. You should be able to hold Mazen with one hand and snap open the stroller with the other. Then collapse it later with one hand, too. LOVE the cowboy boots and the picture of Mazen looking up at Matt! So sweet!! question regarding bringing the baby to public places: my sister’s doctor had her wait 3 MONTHS before she was allowed to bring her son to a grocery store/store of any kind. She was allowed to bring him to a restaurant, etc. if they sat outside. My mom and I thought this was crazy! What does your doc say, do you know? lol that’s good! It’s kinda like people feeling like they can touch a pregnant woman’s tummy-hands off the baby! 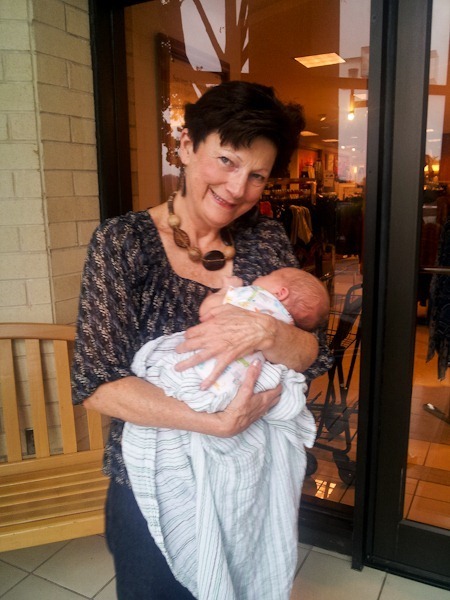 That’s why I loved carrying my babies in the sling–it provides a “bubble” of personal space that people do not invade. So they may peek in and look at baby but they don’t touch or ask to hold them like they would if he were in a stroller or I was just holding him. I had a new mom who was scared to death to go to her HUGE multi-family reunion with her 1 month old because she knew once one person held him he’d get passed around like crazy. I told her the sling trick and she said it worked like a charm! I saw this article today on new parents and sleeping and thought of you, especially because the main picture is of a bear catching some zzzzs. Not my intention. I’m just trying to figure out which Stoller works for which occasion. As others have said, the Bb is not good for travel (in a rainstorm) but it’s great for walking. The hand me down is also 6 years old, so there are parts that dont work (the break). I will pay it forward when we’re done with it too. I don’t have kids yet (and I won’t anytime in the near future) but I’ve been babysitting my entire life, and I can agree that NOTHING is more frustrating than a complicated stroller + a fussy baby. So stressful! 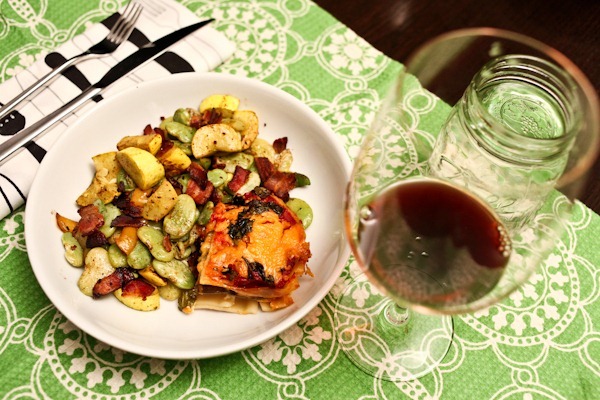 And I love that succotash recipe… It looks so simple and flavorful. Going to bed between 8-9 sounds like the way to go if it means you’re getting rest! Not there yet re: strollers but it seems like unloading any stroller in a rain storm would be a total pain?! The Belk at our (crappy, small town) mall has a covered drive through for drop offs! Maybe a store at your mall has one too for future use. I’m guessing you bought a snap and go! I had written it off as just another newborn purchase that will only be used for a couple of months but I found some on Craigslist for around $30 so might end up getting one after all since we have the BOB for walking/city life. Looks like you’re a pro at public nursing! Good for you! You seem to have been blessed with a totally effortless birth/post-baby lifestyle I guess you could say. You’re one of the lucky ones! I see some mothers struggle with nighttime feedings, upset babies, etc…ooooffff that is difficult!! Unless, of course, you just come across like that on the blog. I’d love to have a baby like Little Maze when I have kids (WAAAAY far away). I honestly think ALL newborns are hard in the beginning! It’s a HUGE adjustment for everyone–even when it’s your second or third baby. 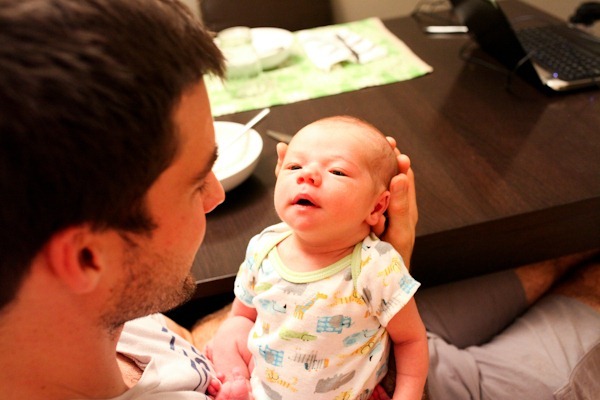 What I think makes a big difference with how new moms and dads handle it are two things–having a support network and having realistic expectations. As a postpartum doula, one of my most important jobs is to teach new moms what to expect from their babies so they don’t get frustrated and upset and think their baby is the “bad one”. When you know that your baby is going to wake up every 2 hours around the clock to nurse for the first month or so, you can manage those expectations and work with it (taking naps when the baby naps is one of the best tools to deal with this). The problem is when new moms unrealistically expect baby to give them 6-8 hour stretches or nurse every 4 hours etc… Also knowing that weeks 3-9 can be very trying as baby is “waking up” from being a fetus and having tools at the ready like The Happiest Baby on the Block techniques or learning how to wear your baby in a sling and other tricks will help to get through this phase. It’s really just like childbirth–education is the key and the more you understand your baby and their behavior, the less likely you will look at them as difficult and just see them as normal newborns having normal newborn behavior 🙂 And just remember that this IS a phase and that by month 3 or 4, they suddenly (almost overnight!) turn into these amazingly happy laughing babies! what was your new purchase? It has been three months since my baby was born and I still find a nice glass of red wine such a treat. I didn’t even realize how much I missed it until I had my first glass. You need a City Mini or a Snap-n-Go. The bugaboo is a great stroller for going on walks, but it’s lousy for getting in and out of the car. I think of it as a Manhattan stroller – perfect for walking and lousy for stashing in the car. The City Mini folds with one hand – you just lift the handle and it collapses into a flat rectangle. It is perfect for gate-checking on an airplane, stashing in the trunk of the car on top of your luggage, or carrying it up and down stairs if you have to do that. You can even collapse it with the carseat attachment. I think of it as a Brooklyn stroller – great for walking, but also collapsible and versatile for occasional car trips. I don’t work for City Mini – just own one and love it. We have the bugaboo too. It’s not a good traveling stroller! We put Milo in the regular seat when he was about 3.5 months old… The bassinet was useless to use, it became a cat bed along with the MamaRoo, it is easier to fold when you don’t have the car seat attachment. But it is an AWESOME walking stroller, would definitely buy it again. We also have the Moutain Buggy Terrain, folds easily! glad to hear similar sentiments. I took the new chicco caddy I bought for a walk and the bugaboo definitely wins for walking! Those pics with Daddy are beyond precious! I haven’t had butter beans in forever! Thanks for the idea. LOVE all the pictures of Mazen! Love the two shots of father and son…frame worthy! Hi Kath, I’m a new reader of your blog, and have linked it to mine. Your posts are wonderful and I am so inspired by your approach to oatmeal! Your mention of taking Mazen to the bakery reminded me of a kids book I picked up from the library recently called Cinnamon Baby. I think you’d love it (http://www.amazon.com/Cinnamon-Baby-Nicola-Winstanley/dp/1553378210). I also have a question concerning diet (I read your amazing story of losing 30+ lbs). In this post you mention having seconds. Portion control (with some exercise, though I need to increase that a lot) is my weight loss method right now and sometimes it is so hard not to have seconds when something tastes soooo good! 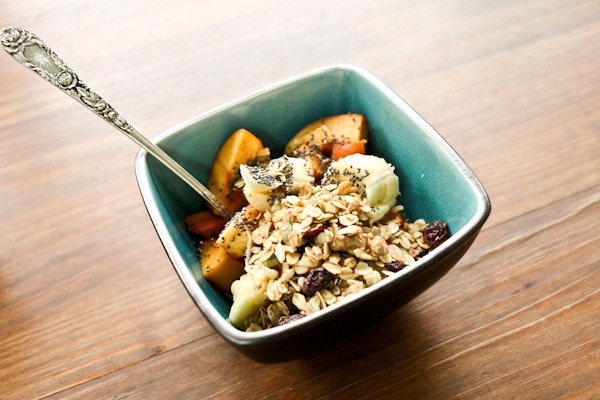 Are you really strict about sticking to one serving for the most part? Thanks for your inspiring posts and big congrats on your beautiful baby boy. Zoe–check out The No S Diet (it’s truly NOT a diet though). No S stands for no snacking, no seconds and no sugar EXCEPT for on S days (Saturdays, Sundays and Special days like holidays or birthdays). I have tried EVERY–and I mean every–diet known to woman kind and this is one thing I have been able to stick to (and enjoy!). There are no restrictions on food groups except the no sugar during the week (which makes me really appreciate it on my treat days). You don’t even have to buy anything–all the info is on his website for free! Those thick, fat beans do look SO good. I love big beans like that, too. And good for you with just sitting down to feed baby. That’s what babies do, they get hungry. And you are an old pro already with nursing in public. Awesome work, mama! Bummer about the stroller. I have the UppaBaby Vista and love it. You can breakdown with the seat adapter on it and the basket is huge. Sounds like a hectic little outing but those boots are super cute. Your food made my already hungry tummy start to scream at me. We have an uppa too! Love it! How the heck do you fold it with the adaptor though? We have an adaptor for our chicco car seat which has been great! Can you let me know which stroller you switched to? A Chicco brand? Also, how are you liking it so far? I’m due in January and going to register this weekend! I use a melitta one cup drip filter, really easy to make one fresh cup if your beans are already ground. Rainy days with a baby are no fun, unless you can stay home and cuddle. Love the boots! Sorry to hear about your troubles with the stroller. I’m so surprised because we have the Bugaboo Bee and haven’t had any other those problems. Sounds like that model isn’t very good. My hunger has definitely increased with nursing and I have much more of a sweet tooth (which I never had before) which I assume is my body needing the quick energy. Sweet sweet babes you got there! Oh man, your rainy day makes me wonder how I could ever have a family in NYC! So many people do it (and I really don’t want to leave), but it seems so tough. Not to mention, my bf and I live in a 5th floor walkup. Yikes! 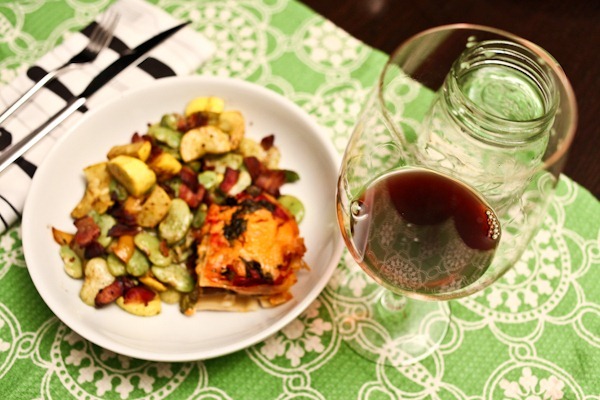 Anyyyway, that meal looks delicious and I’m loving the Matt + Maze photos. I bet Matt loves it when you stop by work! I don’t have a garage and have never given it a second thought, but I can definitely see why that could present certain challenges once a little one comes along! 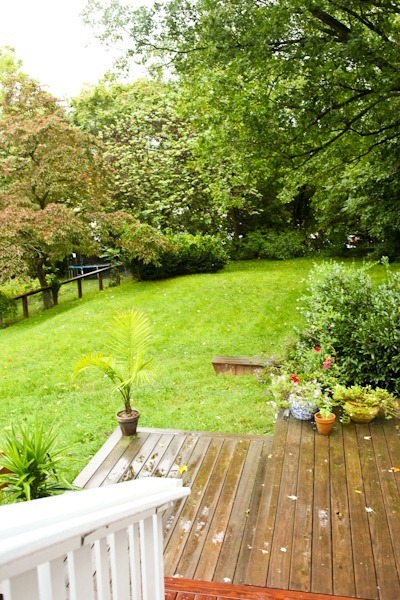 Hmm…maybe a carport would be a semi-solution? Ah, love the Maze and Matt photos! That wrap looks comfy. Have you tried cold-brew coffee? I prepare a big jar and keep it in the fridge for coffee on demand. Not only is it convenient, I actually prefer it to regularly brewed joe. It’s less acidic and not as strong. Yeah all summer… Guess I could just heat that up but it’s not quite the same! UppaBaby makes a sweet stroller! 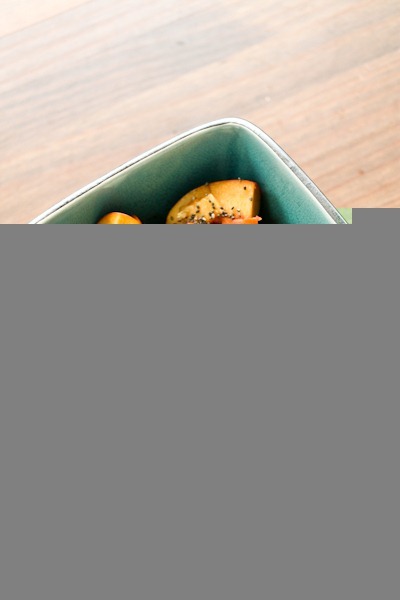 Your blog has introduced so many new foods to me! The first was overnight oats! 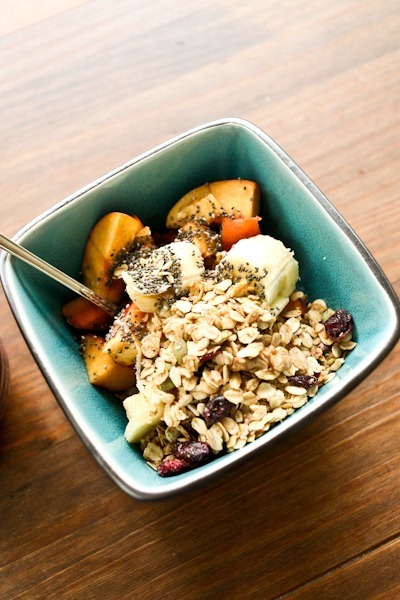 And then there are the chia seeds, siggi’s yogurt, and nature’s path granola to name a few. But today, I was at the store looking for a yummy beer and I saw PUMKING beer!!! Of course I thought of you and had to buy a bottle. I’m enjoying it right now and love it! Lets me honest though…you love it for its high alcohol content?! haha just kidding. It tastes fabulous! Anyway, I just wanted to say THANK YOU for introducing me to foods I otherwise would know nothing about! Cheers to Pumking! And cheers to being a new mommy! Haha high alcohol indeed! So glad you like it! Those boots are amazing. I need to go on a hunt for them, definitely. And congrats on being a new mommy! I love all of the pictures of Maze with Matt!! So precious! Charlottesville question for you…..my husband is doing a rotation at UVA and we’re (my 3 kids and myself) going up to visit him. Are there any family-friendly restaurants you would recommend? I’ve heard so much about the great food and certainly don’t want to do fast food, but realistically we can’t expect a 2 year old to sit down and be quiet for long! I have to say I think Maze looks just like his daddy. And, thank you for what you do on your blog with food. My eating habits have changed for the better since I’ve following you. You guys make a great looking family. So happy for you. Wow Maze is going from 8 to 1 am with only one nursing? That’s amazing at two weeks old. Are you exclusively nursing on demand or is Matt giving him pumped bottles? He’s cuter every day btw! I live in Chicago, which may explain why I’ve never heard of the “Southern seasoning” that was put on your beans. What’s in it? I love your long posts. Your little boy is so cute ! LOVE those boots! i’m looking to buy some soon for a spring wedding that i’m in. i’m hoping to wear them towards the end of fall to break them in, and to football games of course! He seems to like his car seat more, and our walks are very short right now. If I were walking for hours, I would be more hesitant about the car seat’s positioning. We’ll try the bassinet again soon. Maze just keeps getting cuter! Did you know what you were going to do with your hand-me-down stroller? I just got a BFP after a lot of time and infertility money and could use all the help I can get with baby purchases:-) And I won’t use it in the rain – that sounds awful! You will soon get the hang of it all…know you are not alone in all that you are experiencing. First time through motherhood is a bit challenging…by the time the second one comes along…you wonder how you ever thought having one was an issue! Yeah, Kath, as other commenters said, GET A KEURIG! STAT! I love it and use it way more than I ever thought I would. You will love it! I have never thought that the Keurig coffee tasted very good!! Maybe because it’s mass made? Can you put your OWN grounds into a pod? If so, I would want to do that. Yes, they have a reusable pod you can put your own grounds in. 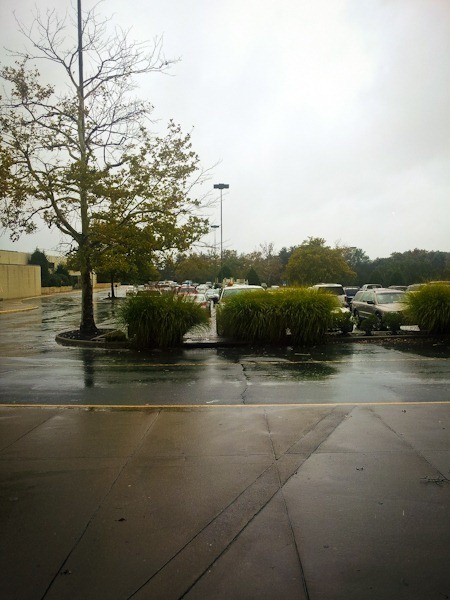 I hate shopping in the rain…I can only imagine how much more difficult it would be with a little one! Oh my gosh – those pictures of him with Matt are literally the cutest thing in the world! !